Plan the adventure of a lifetime with this free guide, The Expert's Guide to International Travel. Have you ever wanted to pack your bags and go globetrotting? There’s no better time than the present! International travel is something that everybody should do if they get the chance. Not only does traveling internationally broaden your horizons and cultural understanding, it’s also really fun! In this guide, you can learn everything you need to know about traveling abroad, from what to pack in your suitcase to which side of the road you should be driving on. Learn how to survive in a country where you don’t speak the language, discover the best apps for traveling around the world, read about how to keep your money safe and more. From travel tips to travel safety, this expert’s (or expat’s?) guide to international travel is the perfect resource for your next adventure. You can download “The Expert’s Guide to International Travel” right now and start planning your next adventure. Get your free guide today. Decide how and where you’re going to travel. Plan a trip like a professional. Discover the secrets of seasoned travelers. Enjoy the freedom of traveling abroad. Learn about everything your embassy can do for you. Discover different social norms around the world. Find out how to keep your money safe while you travel. Read about tips and tricks to make your vacation extra special. Remember, you can download this guide immediately, read it at your leisure and open it whenever you start to plan your trip. What are you waiting for? Download a copy of this awesome guide today! Traveling abroad is fun and exciting. When you’re on an international vacation, you don’t want to miss a thing. 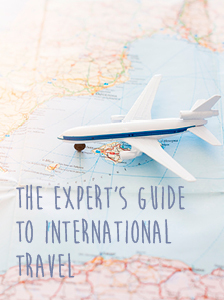 With our guide, “The Expert’s Guide to International Travel,” you don’t have to. You can download these and other great guides right now. We hope they inspire your next big vacation.